Bhutan is a small country in Asia that is often referred to as the “Land of the Thunder Dragons” the mythical beast that appears on its flag. Bhutan is protective of its centuries-old cultural traditions. Television is banned and the people are required by law to wear the national costume. Both tourism and mountaineering are limited in some places. Most of the people of Bhutan are Buddhists of Tibetan descent. Another important group is the Nepali speaking Hindus. Bhutan is a land of extremes. Bananas grow on the humid plain that borders India, and forests of oak cover the cool central hills. In the north, the rugged Himalaya Mountains lie permanently under ice and snow. These attractions are the top ten not to be missed places in Bhutan. The Taktsang Monastery or the Tiger’s Nest is the most famous attraction of Bhutan that is literally perched on a cliff with a peak of 900 meters high. The location is about a two hour walk through the beautiful forests of firs and each curve has a spectacular sight. To get to the lair of the tiger take your pace and do it very quietly to admire the landscape and settle down to an altitude of 3000m. Approaching the monastery you can perceive his greatness and majestic presence of the monastery standing out among the rocks. The first piece is feasible even on horseback but in the last part, is a test on physical agility as you need to deal the walk to the steep hill. The walk can be broken by a break in the cafeteria. The monastery is impressive and when you’re at the face you will almost believe the traditional tale told by the locals that the hair of the angels keep him tied to the rock. The last stretch of the walk is a long staircase up (700 steps) which then leads straight to the entrance of the monastery. It is forbidden to take pictures inside the entrance and you have to store backpacks, cameras and mobile phones in the small counter near the gate. On this temple lies the preserved imprint of the body of Guru Rinpoche, Padmasambhava, and also the imprint of his finger. The experience is fascinating especially where the Buddha stands in the prayer rooms and the many gifts of the pilgrims to accompany their journey, all done in typical Bhutanese arts. The place is truly magical, mystical and powerful, and must not be missed when in Paro, Bhutan. You have to look for the right time (mid-October) to enjoy it fully. The Paro Dzong or the Rimpung Dzong (his full name) is dominated by the mighty and squared by the valley. The classic image is not to be missed especially the beautiful covered bridge that exceeds the Paro Chou in the foreground, the white walls of the dzong, and in the background above, the bulk of the Ta Dzong, and the inevitable tower that is now restored and turned into a museum. Unfortunately, after the earthquake of September 2011, the access to the Ta Dzong is not allowed and you can see some cracks in the plaster and the wounds left by the earthquake. Inside the dzong, there are buildings dedicated to religion plus you can not miss the wonderful cosmic mandala painted on the exterior walls. The murals of the corridor is great and by all means enjoy your visit slowly and take the time to look carefully at the statues of the Buddha one by one. As in all other Dzong structures in Bhutan, one side and is reserved for monks and the other side is for government offices. Although it is not very large, it is well maintained, informative, and impressive. The imposing steps of the Chele La Pass is about 40 km south of Paro and is one of the highest points at 3988 meters. The road is narrow but well paved and takes about an hour and a half to get there all the way to the peak. There is an impressive amount of prayer flags in this area. Calmly view the elevation and enjoy the scenery or have a picnic on the grassy and shaded areas of the place or better yet take a walk up the mountain to the north, you'll enjoy the scenery that is even more beautiful. Take great pictures of the panoramic vista from above this peak. It is not allowed to be visited when the weather is overcast. It is needless to go if it rains or if the weather is cloudy and. On the way back a few kilometers below the pass towards Paro there is a small attraction to the left that takes you to one of the few monasteries reserved for nuns. It is a small version of the Tiger’s Nest that must also not to be missed, because it is much less touristy and visited by curious tourists too like the other famous one. From the Dochula Pass you can have a unique view of the 108 chortens or stupas sprouting beyond the valley over the Himalayan forests of cedars and firs. It is a magnificent view that makes the place even more attractive and picture perfect. This pass is only about 40 minutes from Thimphu and situated at the hill opposite a temple. It is very crowded during weekend as locals come in to enjoy the scene and a picnic on its park. You can shoot beautiful photos. It is usually somewhat foggy, but sometimes you can see the snow-capped Himalayan Mountain in the distance. This calm and cold place deserves a mandatory visit. It is a mystical site that is truly imposing from afar at 3150 meters altitude. If you are lucky and good weather permits the views down below are equally astounding. It is a great place for a break on the road between Thimpu and Punaka and really captivating with its mysterious atmosphere even from the road. The shrouded clouds freely drift around here in the fog. The air is very clean because of the high altitude and there are wooden tables and benches on its viewpoint where most families gather. You also have a chance to visit a Tibetan settlement near this pass. Located on a steep hill overlooking Thimphu is a large seated Buddha that seems to watch over the city. It rises from the center by a road along the Thimphu Dzong (to visit!). Unfortunately, the development works are not yet completed. When this is done the site will probably be great and really worth a visit. Right now it is open to the public. 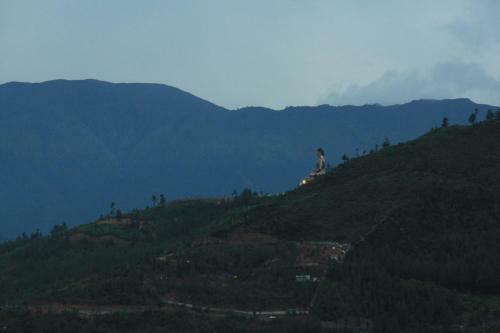 The Buddha Point is just outside of Thimphu and visible even from afar. From the top you can enjoy the great views of the valley and the snow capped mountains in the background. This is one of the largest Buddha statue in the world with 64 m in height. The Buddha, made entirely of bronze is already visible from the valley. At the top he acts accordingly large and regarded as a famous landmark of the city. A park is also being developed in front of the Buddha. It is pretty hot and sunny and since there is no such trees and shade around, do not forget the parasol and hat just to be sure. Once the construction work is completed, it will surely be a pleasant place to relax, enjoy the sun and views! The Tashichho Dzong Thimpu Dzong or the edge of the still rather rural and acting capital Thimpu of the Himalayan Kingdom of Bhutan is an impressive complex. Established and built in 1965 without a drawn plan and without a single nail, this fortress-like facility houses both the government as well as the top clergy of the country. Therefore, a visit is possible only from 17 pm after the administration offices have closed. 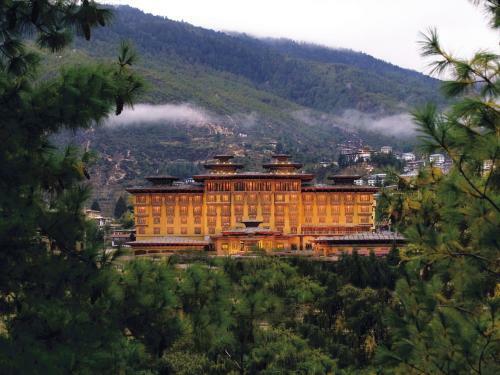 The Dzong in Bhutan's capital city presents itself as truly royal. Since the royal government offices are housed in it, the huge complex is filled with people from all sorts of nationalities who want to catch a glimpse of the royal family. The spacious grounds and the courtyard are almost invariably greater than any other Dzong in the country. Tourists are especially impressed by their murals. Also the proximity to the residence of the king is impressive. But you should schedule the time to fully enjoy the features of this attraction. Approval is not necessary as the admission in the courtyard is free. The Dzong (fortress-monastery) Thimphu is beautifully preserved or restored; an external and internal inspection is possible if one has a permit (tourist permit) from the authorities concerned. The tour operators oftentimes take care of this matter so it is advisable to avail of a tour package for a hassle free tour of the entire complex. The National Memorial in Thimphu, Bhutan's capital was built and dedicated to the late third monarch of the Himalayan Kingdom of Bhutan, Jigme Dorji Wangchuk in 1974. This walk stupa has now become a landmark of the capital and of the strongly religious people who express their devotion each time they pass here by walking around clockwise. Do not run counterclockwise because that brings great misfortune (as locals say). Unfortunately, the interior in which the Buddhist figures including the Yab-yum representations are mostly closed all the time. This temple is very popular with the locals. In the morning before work, they walk here a few times to get around the stupa and ask for the grace of Buddha. Even the elderly locals spend their day here, walking around the chorten, spinning the big red prayer, praying, some of the fit and able even make prostrations. The atmosphere is particularly quiet for a shrine commemorating the third king. It is a nice place to experience the cultural tradition and the Omni - present spiritual sense of the Bhutanese. The MotithangTakin Preserve, also known as the Thimphu Zoo for many locals is a small natural habitat that was created to preserve the national animal of Bhutan, the Takin. It was originally a mini-zoo, but was converted to a reservation center for the Takin. It is a forest reserve that mimics the natural habitat of the Takin. About 75% of the territory of Bhutan is a nature park and here you can clearly see the care and love that these people have for the conservation and protection of its territory. The Motithang Takin Preserve is the only opportunity to see one of the rare heraldic animals of Bhutan up close for most travelers. At the Choki Traditional Art School it is interesting to visit the various classes where you can see how students are engaged in every single discipline in every different levels of difficulty. If you have the time to observe you realize how hard it is and how long it takes to make a piece of craft that respects and symbolizes their tradition. For those interested in crafts and typical products of the countries you visit is well worth knowing because it has all the art products made in Bhutan. There is also a shop within the premises of the school to buy the products. The Kurje Lhakhang in the city of Bhumtang is located on a hillside a few kilometers north of Jakar. To get here you need to pass through small villages. It consists of three monasteries that were built in completely different eras. The most interesting and also the oldest (the first one from the right side) is the one with the inner rooms full of statues (photography is not allowed). Outside there is a chorten of medium size on the perimeter and a hundred small chortens all around. Take note of the ones placed at the four cardinal points that are of a different color. At the other side (to the right, toward the mountains) there is a path that leads to a sacred spring, just follow the many locals who go to fetch water from the cans. It is fun and interesting! A Wonderful Trip To Bhutan!